If I could live off of one thing, I’m pretty sure it would be some kind of plant-based bowl. It’s hard to beat the combo of seasonal veggies, whole grains, beans/legumes, nuts/seeds, all topped off with an incredible dressing. I’m rarely disappointed. This bowl in particular is inspired by Kerr Street Cafe’s Buddha Bowl (a local restaurant), which I treated myself to the other week. Let’s just say this preggo mama basically had to waddle out of the café, because I could not stop eating despite baby nudging me that space was getting a bit tight in there. (Thankfully, I came armed with an empire waist dress!) I knew I had to recreate the bowl at home, and I’m sharing my delicious take on it today. Before I get to the recipe, though, I have a couple exciting pieces of news to share! "The Oh She Glows Cookbook was published in April 2014, yet it still occupies the number one spot, even outselling heavy-hitting non-fiction titles published in 2015 like Shift Work and even the only Canadian-authored colouring book to make the list: Fantastic Cities. As an enduring title, it sits alongside 2013’s The Inconvenient Indian and the fourth-bestselling paperback children’s book of all time according to Publisher’s Weekly, Love You Forever by Robert Munsch, which was published in 1995. The rest of the titles on the list were either published for the first time in 2015, or released in a new format." THANK YOU from the bottom of my veggie-loving heart. 2) In case you haven’t seen this on my social media channels, Chapters/Indigo is running a pre-order contest for their Most Anticipated Books of 2016 list, and my next cookbook, Oh She Glows Every Day, is included (so cool!). 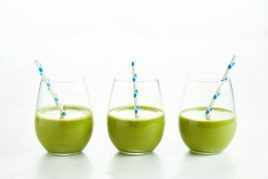 You could win a basket of my favourite kitchen items, valued at $500, including a Cusinart food processor, Bodum Brazil French Press, Wusthof Classic 8-inch Vegetable Knife, Sunwarrior Warrior Blend protein powder, Do Matcha green tea powder, and more. All you have to do is pre-order the book from Indigo and be entered to win automatically (if you pre-ordered from Indigo earlier this year or last, you’re automatically entered…yay! ), or you can send a mail-in entry explaining what it means to you to cook for the people you love. Be sure to check out the full contest rules here. You can pre-order by visiting Chapters/Indigo online. This contest is open to Canadian residents (not including Quebec unfortunately—sorry guys!). A big thanks to Chapters/Indigo and Penguin Canada for making this contest possible. At long last…onto this glow-rious food! 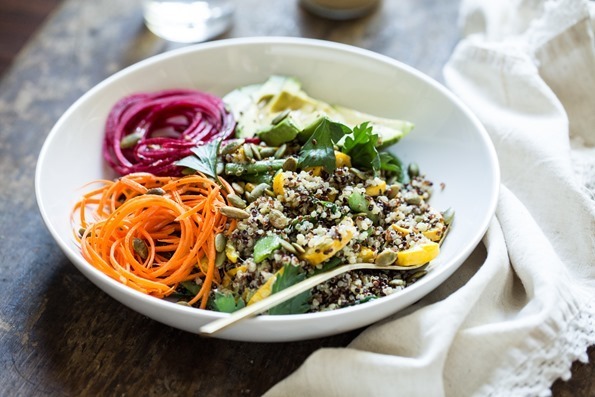 Like most plant-based bowl recipes there are a few different components that need to be prepped for this Buddha Bowl, but I'm happy to say they're all incredibly easy to whip up. I like to prepare the House Vinaigrette and quinoa in advance, maybe the day before or the morning of. This way, the bowls come together incredibly fast. While I created this bowl with summer in mind, rest assured that you can swap out the summer veggies for seasonal veggies all year long. You can also boost the protein by adding your favourite beans/legumes. 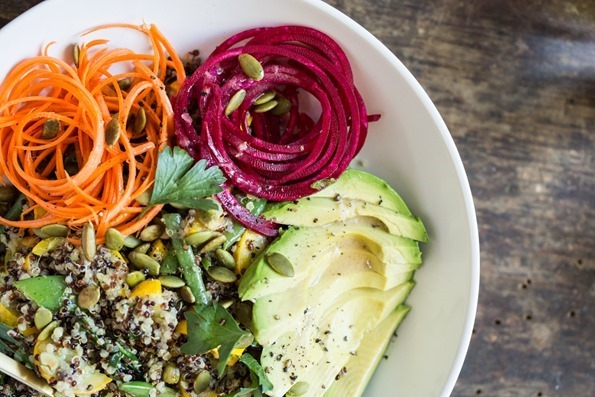 This bowl is inspired by Kerr Street Cafe's Buddha Bowl. For the House Vinaigrette: In a small (1-cup/250 mL) mason jar, add the vinegar, lemon juice, Dijon, garlic, maple syrup, salt, and pepper. Secure lid and shake vigorously to combine. Remove the lid and add in the olive oil. Secure the lid once again and shake vigorously until the oil is emulsified. Taste, and add additional maple syrup or oil if desired. Cook the quinoa: In a medium saucepan, add the quinoa along with 2 1/4 cups (560 mL) water. Stir to combine. Increase heat to high and bring to a low boil. Immediately reduce the heat to medium-low, and cover with a tight-fitting lid. Cook for 13 to 16 minutes, until the water is absorbed and the quinoa is fluffy. Remove the lid and season the quinoa with salt and pepper. Sauté the vegetables: Meanwhile, in a large skillet or wok, add the olive oil, green beans, snap peas, and zucchini. Stir to combine and season with salt. Sauté the veggies over medium-high heat for about 10 minutes, until tender but not overcooked. You still want the veggies to have a light crispness to them. At the end of cooking, stir in the spinach and cook for a couple minutes until it wilts. Turn off the heat. To assemble: Stir all of the cooked quinoa into the skillet veggie mixture. Increase heat to medium, and cook until warmed throughout. Taste and add more salt and pepper if desired. Portion the quinoa-veggie mixture into large shallow bowls. 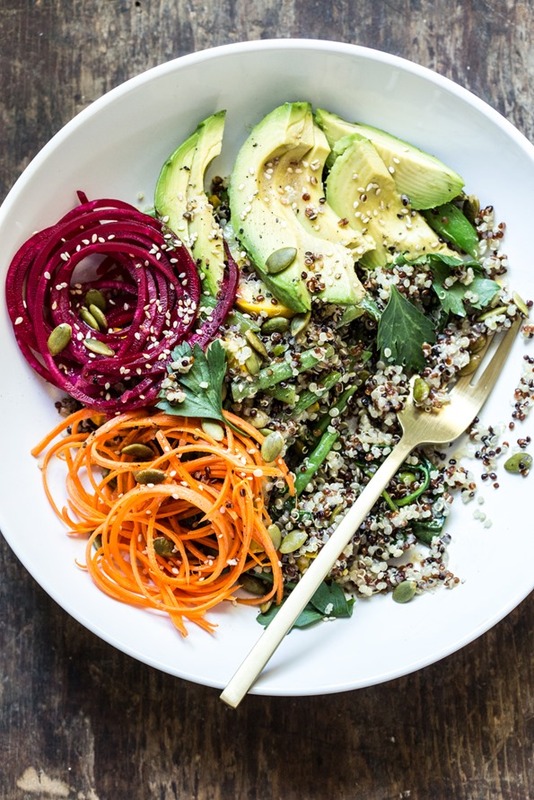 Top the bowls with the carrot, beet, avocado, and a generous amount of toasted pepita seeds. Lastly, shake the House Vinaigrette and drizzle about 3 to 4 tablespoons all over the top of each bowl. Any leftover Buddha Bowl mixture will keep in the fridge for up to 3 days, and the leftover House Vinaigrette will keep for at least two weeks. The olive oil in the dressing tends to solidify when chilled, so be sure to allow it to sit on the counter for a bit (or warm the sealed jar in a bowl of hot water), and shake well before using. A great way to serve leftovers is to toss some baby mixed greens with House Vinaigrette and stir in some warmed quinoa-veggie mixture. Top it with sliced avocado and toasted pepitas for a quick meal. * If you own a spiralizer, be sure to use a very thick carrot for spiralizing (the smaller ones won't work). Or you can simply julienne the carrot with a julienne peeler, which is what I usually do. ** To avoid staining your hands, try wearing kitchen gloves while handling the beet. *** To toast the pepita seeds: Spread the seeds onto a baking sheet and toast them for 8 to 12 minutes at 325°F, until golden. Congratulations, Angela! What amazing news! Not at all surprising, though ;) Well done and can’t wait for your new book! Congratulations on book list staying power, just goes to show that plant-based recipes appeal to so many! This summer bowl look just like what I need right now, I’m melting in the heat! 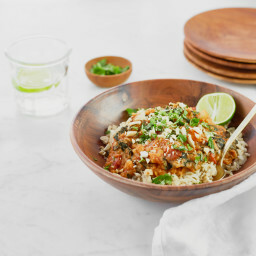 And the bowl looks deeeelish! Today I made your oil-free chocolate zucchini muffins and my family promptly inhaled them…yum. This recipe is my new favourite and my new spiralizer has been put to good use! Congratulations, that’s an amazing accomplishment!! 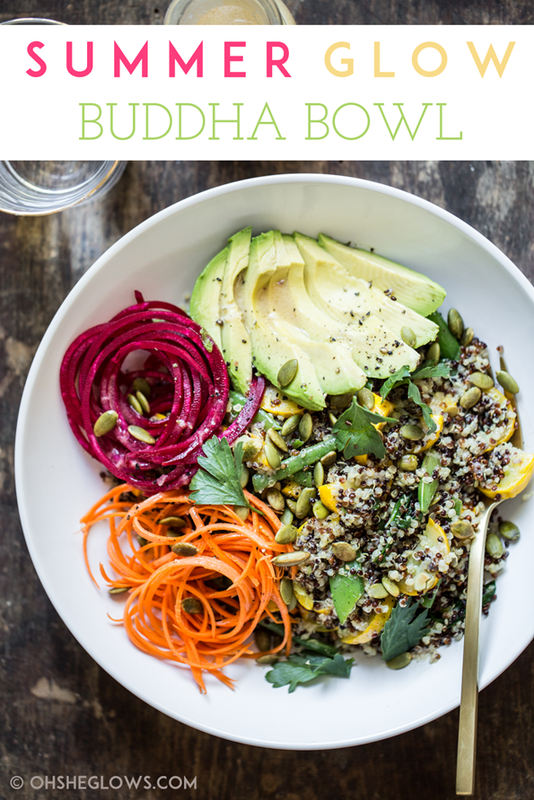 I love buddha bowls and your recipes, so combined together, this is awesome :) It looks delicious! Wow, congratulations! That’s so amazing (but not that surprising). Can’t wait for book #2! …all kidding aside. It’s delightful to read about someone’s success when they are invested with their heart and soul in what they do. Your mission to share your hard-learned lessons while encouraging clean living is so inspiring. And fun! Congrats on everything! 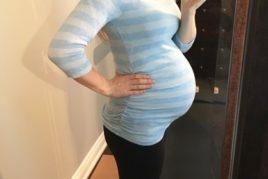 L’il OSG Baby-to-be, OSG2.0, Top-Selling OSG#1 in CA, New App, house reno’s…. …what a “sweet ’16” for you all. Totally deserved!! Congrats, so exciting to be up there with ‘Love You Forever’!! I love your blog & cookbook, just pre-ordered the second, can’t wait! I’m with you- I could probably live off of bowls like this! Thank you for getting me hooked on them. :) And a huge congratulations on your news! I love love love your first book (I meal plan with it every week!) and absolutely cannot wait for the second! Have a great weekend! Thanks, Katy – you have a great weekend, too! Saw this on your snapchat and looks totally delish! Your snapchat has definitely inspired me to make some delicious eats this summer! Pre-ordered your book and can’t wait for your bonus recipes :) But am TOTALLY bummed the contest isn’t open in Quebec. Hey, Fritzi! I talk about my fave spiralizer and julienne peeler in this Friday FAQs here (question #1). Hope this helps! Hi Angela, this looks delicious! Is the beet raw? I can’t be sure from the photo. And congratulations on the success of OSG cookbook. I’ve really enjoyed cooking from it. Congrats! Serving bowl for lunch today! Looks delicious. I have pre-ordered book from my local independent book store, Blue Heron Books! Please slip my name in your draw if you are able! Many thanks. So look forward to your blog and recipes!! This is so good! I used green beans, yellow zucchini and asparagus, yum! So happy to hear you enjoyed it, Karen! Congratulations on the exciting news! I absolutely love the cookbook and your blog. 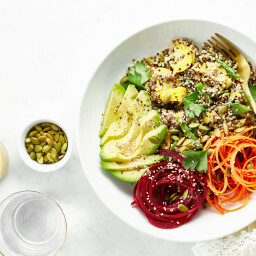 This buddha bowl looks so good, I cannot wait to try it! Thanks, Myra! 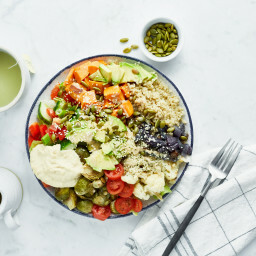 :) When you give the Buddha Bowl a try, I hope you enjoy it! Hey Angela! Any alternative to the red wine vinegar? Angela that is awesome and so inspiring!! You go girl! I saw this on Snapchat and was anticipating the post as I had fresh green beans and yellow squash ready to go! It was delicious. I can’t believe I made dressing that good – thank you! I needed more carrots for the leftovers but that’s a quick add. I tossed with greens as you suggested and had a couple of lunches packed and ready for work. Yay! 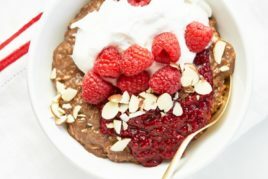 It is so healthy and easy! Congratulations on your 2015 success! Well deserved. I’m on pre-order for book the new book and am thinking lots of Christmas presents! 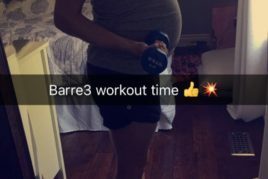 By the way.. I’m expecting baby #1 and enjoy reading your pregnancy posts! Oh my how beautiful! I bet this is beyond tasty too. I love all the colors and textures in this. This look simple and i will definitely give it a try. Thanks for your sharing. I hope you enjoy it if you try it, Rachel! Made this tonight. Came home at 7pm and was eating it by 8pm. Yes, some prep, but it’s worth it. Great meal for busy humans to make on a Sunday and have healthy leftovers for lunches or another dinner. It makes a bunch of clean food ready to go. I used the exact ingredients. So good! Merci Angela! I’m happy to hear you enjoyed it, Becky! This was extremely delicious, filling and easy! I also felt great after eating it. For some reason I had been intimidated by these kinds of bowls but I love how they can be adapted to whatever veggies are available. I am excited to try more of your recipes soon. I love that about these bowls too, Caitlin! I’m so glad you decided to try this recipe, and – of course! – that you ended up enjoying it. I hope you love whatever you decide to try next just as much! This recipe was fantastic! I made exactly as directed (except left out the beets as I didn’t have any) and this was so tasty. It was good for lunch the next day as well. I will be making this again next week! OMG!!! So yummy!!! Thank you Angela for another amazing dish. I went to the farmers market this morning here in Calgary and successfully picked up all of the ingredients locally sourced. Since everything was so fresh I decided to try this bowl cold by keeping the veggies raw. I made the quinoa earlier this morning so it had cooled down and just tossed all the remaining ingredients together with the dressing. I also had some leftover sunflower shoots in my fridge so I added them as well. I can’t get enough of this salad…and the dressing to die for. I made this for dinner tonight and it was Ah-Maz-Zing!!! Husband-approved! I sautéed the beet greens with the rest of the veggies and they were a big hit! I always make sure I buy beets with healthy greens so they don’t go to waste. Thanks for all of the amazing meals Angela!!! Thank YOU for the great comment, Jen. I’m so glad everyone enjoyed the bowl! This was delicious! Added a little hot sauce since I didn’t have Dijon mustard. Some extra nuts on top are a great addition too. Also I guess if you are going to use a spiralizer it’s worth investing the $ in a good one. I used the vegetti and it spewed a lot of small chunks. Probably only works on soft things like zucchini. Nevertheless the recipe was a hit amongst my dinner guests who doubled as the people who helped me make it. 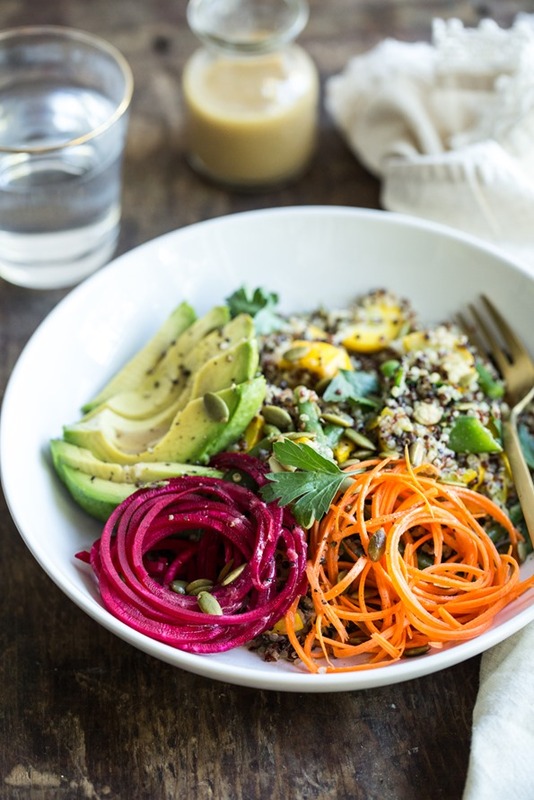 Angela, those photos are making me salivate – totally agree on the love of summer veggie bowls. Trying this recipe is now on my to do list! Raw or cooked beets? I have never cooked with beets before, I am kinda scared, even tho I love them when dining out. I wanted to leave a comment because this has been my absolute favorite lunch of the summer! The combination of flavors and textures is fantastic, and I love that I can prep all of the components one day and then have lunches ready for the rest of the week. If you’re like me and usually just haphazardly throw lunch together with whatever happens to be in your fridge, take the time to follow recipe for once – this one is worth it!! Just devoured this and it was so delicious! I’m happy to hear you enjoyed it, Elizabeth!! Wow, this looks delicious. I’m really hoping of becoming a vegan but I need some inspiration for meal ideas. I’ll have a look at your blog, maybe it could help me. From what I can see, your blog looks amazing, and so does the food! You’ve out done yourself with this one, couldn’t stop eating it! Can’t wait to try all your new recipes from the new cookbook! It was like Christmas morning when it got loaded onto my kindle Tuesday morning. You and Blender Girl are the reason and inspiration for my new found passion of cooking and eating healthy, THANK YOU! Thanks so much for the lovely words, Cheryl!! I hope you love the new book. Looks amazing and congrats to the book!! Love your blog so much. We just had this for supper….delicious and thank you! I added a leek and red pepper to the stir fry, for colour. Congratulations on all your successes with the books and blog…it’s very inspiring. Thank you so much for the sweet congrats, Flora! I’m so happy to hear you enjoyed the bowl. I just read your recipe and want to make it for my family. It looks healthy, delicious and colorful and and I can’t myself to making this recipe. I have question, what can I use to make Vinaigrette instead of red wine vinegar? So please reply and to see your answer at once I’ll make it and update your blog page. Hello, i’ve never spiraled before. do i cook the carrot and beet and then spiralize? or spiralize them raw? I love your recipes, we have purchased your new cook book and love it. Thank you for still posting free recipes, this is one reason we made sure to buy the book as you are generous to keep posting free ones for everyone to benefit from. Thank you for this recipe! It is so delicious! We have had it two nights in a row and it is now one of my favorite recipes. I plan on making it again and again and again!! So happy to hear this recipe’s such a hit, Linda! :) I’m glad you found it. Congratulations on the continued success of your book! This gives me hope that there are more people than we realizing turning their focus to plant-based living. Just wondering, if I make the dressing without oil, should I change up the ratios of acids at all? Also, should I add a bit of water? We are following Neal Barnard’s program to reverse diabetes (my husband) and getting rid of oil is recommended. Or, I could make a creamy dressing with the avocado? Any advice you can provide would be appreciated. Firs time cooked one of your recipes. Wow, this was bloody fantastic. We all loved it. Thank you for sharing such great recipes. Hi there, Geraldine! I’m so glad you enjoyed it. Hopefully if you try another recipe of mine, you like it just as much! This looks incredible but the question of whether or not the beets are raw in the recipe was never answered. Is the yellow zucchini also raw? Thank you and so happy and stumbled on your blog! Hi Angela! We’re currently crafting a blog post for Zebra Organics and would love to feature your recipe amongst the top 5 summer recipe list! Is this ok with you? We’ll link back to you. Would love to use one of your images in our post as well. Hi Kim, I’m so flattered you want to feature one of my recipes in your post! Could you send along the request to press[at]ohsheglows[dot]com? Thanks! Any suggestions for substituting quinoa with something equally as nutritious? Quinoa makes me incredibly sick! Hey Taylor, what about cooked rice, spelt or wheat berries, sorghum, or millet as alternative options? Fab recipe! Used the concept with some tweaks for lunch for myself and three kids. They devoured the lot! Have passed the link on to my mum as I know she’d love it too. Ugh I can’t wait until summer and I can make these beautiful, colourful dishes again! hah I hear you Maria! Come on summer! Your bowls look delicious, but I wish you would include nutritional information. Best of luck with your new book! The nutritional info will be coming later this year :) Thanks for your good luck wishes! Sooooo yummy! Really enjoyed it. Surprised by how much I liked the beets raw. I did cheat and buy veggies already spiralized. I swapped brown rice for quinoa (son is not a fan) and also sprinkled the veggies with garlic salt. Next post: Friday FAQs: Potluck options, Raw Chocolate Brownie swaps, fun lunch ideas, and more!